Better last than never. Colleagues Ian Barker, Alan Buckingham, Brian Fagioli, Mihaita Bamburic, Wayne Williams, and Mark Wilson have all picked their favorite tech for the year. I join them. Only things I actually have used qualify for consideration. My list focuses on one aspect: Value. Which products I see delivering the most value for money spent. Surely your value choices will differ. You can spend 25 cents and get loads of value from something or $2,500 and little at all. With that short introduction, I present my five favorite tech products of 2013 (and one from 2005, newly discovered). My first choice is arguably low-tech and didn't release in 2013. I simply discovered it during the year. AeroPress makes the best brew I've ever tasted. The device requires a little muscle, and for $25 street price is unbeatable value. Manufacturer Aerobie claims the little coffee press makes the "world's smoothest, richest brew". I have to agree. In April, NY Daily News headline "When it comes to single-cup coffeemakers, it turns out that cheaper is better: We tested seven models and the $30 AeroPress beat out the $5,500 Jura Giga 5", gripped my attention. 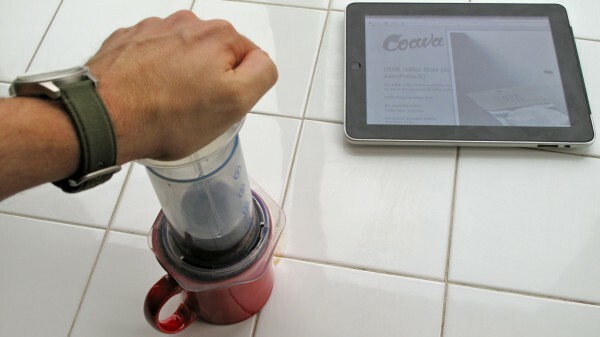 I emailed the story to my wife, who after doing some research bought AeroPress. What a value! We use Trader Joe's Espresso blend and get coffee that, yes, tastes like 5,500 bucks! "You don't often find the best and brightest when searching for products", my wife says. In all her Amazon searches for coffee makers, AeroPress didn't appear once. What a tragedy. During the days of analog cameras, Fujifilm competed unsuccessfully against kingpin Kodak. How strange events turn. Kodak is history, while Fujifilm is the future, producing some of the best and most affordable digital cameras anywhere. My second choice is the company's X-Series mirrorless digicam family. Fujifilm released three new compacts (X100S, X20, XQ1) and as many interchangeable lens digicams (X-A1, X-E2, X-M1) during 2013. Digital SLRs are large and bulky because of the mirror. Fuji's design removes the mirror, putting the lens closer to the sensor and thus reducing overall footprint -- that's body and lens. Higher-end models, like the X100S or X-E2, put controls where photographers expect them: On the body, rather than in menus. Some models also come with digital -- and in the case of X100, X100S and X-Pro1 hybrid optical -- viewfinders. Oh, yeah, the cameras take fantastic photos. I gave up my beloved X100 this year, looking to either go with the S model or XE-2. Then Amazon offered 12-month credit with no financing on a new camera, and I gazed at the XE-1's heavily discounted price following release of its successor. I bought the older model for $899 rather than spending $1,399 on the XE-2 or $1,299 for the X100S. I give up dual digital/optical viewfinder but gain an excellent interchangeable lens system within my budget. Kit lens is same on XE-1 as XE-2. Fuji, to its credit, still updates older X model firmware, which keeps the value strong years later. My third choice will surprise some readers: iPad Air. The Apple tablet isn't the lowest-cost but it delivers high value, as I explain in my review. Air is the first iPad I like, and it changes how I work. Apple's 64-bit architecture is so smooth, I now use iPad Air more than my notebook, which has me contemplating big change for 2014. For years I have toyed with the idea of replacing laptop with tablet. But none has offered the right combination of performance, usability, and productivity apps. iPad Air is a tablet that can replace a notebook, and I contemplate putting aside Chromebook Pixel for the Apple tab. In October, HP unveiled Chromebook 11, which Google co-designed. But the laptop fumbled down the field, because of a faulty charging brick. The companies temporarily suspended sales, recalled the chargers, and replaced them with new ones. But those troubles aside, Chromebook 11 offers lots of value for low price. At $279, the laptop isn't the cheapest Chromebook. But, as I explain in my review, the design, exceptional keyboard, and display -- best of class for the price -- make the HP-Google portable right choice, if no one else, for students. If I had kids in the house, I would buy one Chromebook 11 for each. The keyboard is a writer's dream machine -- just right for students. The design, one of four color accents against white, is trendy. Design is a benefit, too. This is a handsome little machine, nicely accented against white, which is canvas for greater personalization. Get out the stickers, kids! Last up: Kindle Fire HDX 8.9". I like Amazon's tab for very different reasons than iPad Air, which I will more fully explain in my forthcoming, belated review. For now, simply, HDX 8.9" is the choice for anyone looking for the Goldilocks tablet. The tweener isn't too big or too small -- it's just right. Improved screen resolution (2560 x 1600) and pixel density (339 ppi), updated Android, and tighter integration into the larger Amazon ecosystem make the Kindle Fire an exceptional choice for anyone living the Amazon lifestyle. Parents, rejoice. No tablet, other than the HDX's sibling, is as kid-friendly. Amazon Prime users get best value, from extras like book borrowing and free movie and TV show streaming. Many of our more techie readers might scold and say Nexus 7 is better, or even iPad mini. But looking at the whole package -- device, apps, and services -- Amazon offers better value for the price.